Since 1968, Wild Sanctuary has traveled the globe to record, archive, research, and express the voice of the natural world - its soundscape. These increasingly rare sounds of the wild inform and enrich our specialized efforts from the field to public performance. "Bernie Krause and his niche theory are the real thing. His originality, research and above all basic knowledge of the sound environments in nature are impressive." Since 1968, Bernie Krause has traveled the world recording and archiving the sounds of creatures and environments large and small. Working at the research sites of Jane Goodall (Gombe, Tanzania), Biruté Galdikas (Camp Leakey, Borneo), and Dian Fossey (Karisoke, Rwanda), he identified the concept of biophony based on the relationships of individual creatures to the total biological soundscape as each establishes frequency and/or temporal bandwidth within a given habitat. His contributions helped establish the foundation of a new bioacoustic discipline: soundscape ecology. Krause has produced over 50 natural soundscape CDs in addition to the design of interactive, non-redundant environmental sound sculptures for museums and other public spaces throughout the world. His installations can be experienced at the National Museum of Natural History (Smithsonian Institution, Washington, DC), the California Academy of Sciences (SF), the Houston Museum of Natural Science, the Chicago Science Museum, the American Museum of Natural History (NYC), five special commissions at the World Financial Center (NYC that performed October/November 2006) and over 30 other venues in N. America and Europe. During his life as a professional studio musician, Krause earned the Pete Seeger slot in the Weavers (1963), and with his late music partner, Paul Beaver, introduced the Moog synthesizer to pop music and film. The team’s work can be heard on over 250 albums and 135 feature films released between 1967 and 1980. 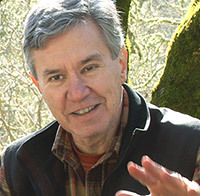 Krause, who holds a PhD in Creative Arts with an internship in Bioacoustics, was a key figure in implementing natural soundscapes as a resource for the U. S. National Park Service and authored the educational soundscape manual for the agency that resulted in a recent book/CD, Wild Soundscapes: Discovering the Voice of Natural World (Wilderness Press, 2002). In 2006, under the auspices of US Fish & Wildlife, the Calgary Zoo, Google, Stanford, Harvard Universities, the University of Utah, and several other institutions, he led three teams to capture the first natural soundscape examples ever recorded in the Arctic National Wildlife Refuge. Until recently, he served on the board of Harvard’s Institute for Music and Brain Science. Krause lives with his wife, Katherine (Kat) in Glen Ellen, California. 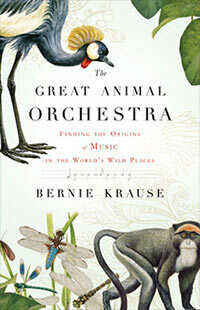 His new book, The Great Animal Orchestra: Finding the Origins of Music in the World’s Wild Places, was published by Little Brown (Hachette) March, 2012. Without sound…there would be no music, no legend, no voice to stir the soul, evoke the memory, or transport the spirit! From the songs of humpback whales and the screams of Rwanda's mountain gorillas to the groan of shifting Arctic glaciers or the rumble of an approaching storm, Wild Sanctuary albums, installations, and recognized authority in the field of natural sounds is authentic, adventurous, and inspiring. Within a changing world, what you listen to matters! "As much spirit as a place, Wild Sanctuary is an exploration of art, science, outreach, and performance - with Natural Soundscapes informing each adventure." The Wild Sanctuary Audio Archive represents a vast and important collection of whole-habitat field recordings and precise metadata dating from the late 1960s. This unique bioacoustic resource contains marine and terrestrial soundscapes representing the voices of living organisms from larvae to large mammals and the numerous tropical, temperate and Arctic biomes from which they come. The catalog currently contains over 4,500 hours of wild soundscapes and in excess of 15,000 identified life forms. Fully half of the natural soundscapes in this rare set are from habitats that no longer exist, are radically altered because of human endeavor, or have gone altogether silent. "Musician and naturalist, Bernie Krause is one of the world's leading experts in natural sound." The public performance extension of the Archive’s field recordings, Wild Sanctuary sound sculptures give voice to vibrant public space installation media and venues. Program and site-specific content, custom-rendered technology, non-redundant delivery options, and final system calibration replicate dynamic 3-D performances just as they occur in wild natural habitats. Wild Sanctuary soundscape installations are so compelling, there is no known equal. Our production, delivery technologies, and installation services generate perfected soundscape environments for venues of all sizes. Select colleagues and associates, drawn from the world’s most skilled field recordists, system design experts, conceptual visionaries, and sound-arts software programmers are creative, experienced, and reliable members of the Wild Sanctuary team. Information regarding special project consultation, exhibit enhancement, location recording assignments, studio production services, and creative arts collaborations is available upon request. Seeking Species Specific or Habitat Ambient Sounds? Wild Sanctuary Audio Archive Selections are available for licensing. Note: In order to protect and value these copyrighted works, and respect that of other soundscape recordists, any use of materials or recordings on this site without written permission or license is strictly prohibited. Facebook Like it on Facebook Available now! To develop and further the evolving field of Soundscape Ecology, ongoing publication and a dynamic media presence provides a vital voice for biophony - the creature chorus of natural sound - and invites new ways of engaging with the wilderness and the wild. From pioneering work in the field of bioacoustics and nature recording to innovative explorations in science and art, Bernie Krause, with Kat Krause and the Wild Sanctuary team, continue to investigate, define, and forward public and academic understanding of the world’s rapidly diminishing 'sonic symphony' through their varied, studied, and creative works. The emergent field of Soundscape Ecology reveals what nature sounds tell us about today’s changing eco-systems - and the creatures that dwell in them.